When planning for a summer vacation, Washington, D.C. probably pops up in the initial conversation before the state of Washington. Which is a shame. 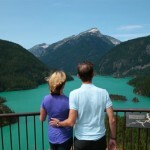 As great a vacation destination as the D.C. is, the state of Washington can be even better. From the looming magnificence of Mt. Rainier appearing in the distance from so many different locations in the state to the shock of stumbling upon a rain forest in the Pacific Northwest that looks like it somehow got misplaced during the continental shift to that iconic spectacular view afforded from the top of the Space Needle in Seattle, a summer vacation in Washington State is a visit to paradise just waiting to be discovered. When planning a visit to Washington during the summer, packing can sometimes be a concern. This is because your vacation activities may range from exposure to the sun in your swimsuit to a snowball fight, depending on where you go. Average temperatures in July can range from highs near 90 degrees in the eastern part of the state to the lows in the 40s in Cascades. The key to packing for a summer vacation in Washington—no matter where you plan on spending most of your stay—is layering. As for the famous rains of the Pacific Northwest, one thing needs to be understood very clearly. While a vacation in June is likely to have a bit of a higher chance of rain than a vacation in July or August, it can be a good idea to check the webcams and weather forecasts to help plan your packing. As for what there is in Washington worth packing…read on for just a few ideas to ignite your imagination. 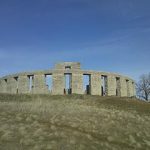 Planning a summer vacation in Washington State is the cheapest way for American families to bask in the glory that is the mysterious ancient structure known as Stonehenge. Think the only way you can stand surrounded by the instantly recognizable ruins is an expensive plane trip to England? Think again. A full-scale replica of the famous British landmark is merely the premier attraction of the Maryhill Museum of Art. While in truth a stunning experience, do not pass up the opportunity to spend at least a few hours browsing through the nearby museum’s permanent and traveling exhibitions and at least a few minutes checking out the extraordinary panoramic view of the landscape highlighted by Mt. Hood (Oregon) looming in the distance from a seat Lewis and Clark Overlook. It’s big. It’s freaky. And it’s free. Kids will spending a few minutes at this landmark that is indicative of the offbeat nature of Seattle. Adults will love spending a few minutes checking out the troll. Then, when the whole family rolls into the hotel for the night, spent and ready to kick back and relax, everybody will be in the perfect frame of mind to log into whichever movie streaming company of choice is currently carrying the unforgettable Scandinavian film Trollhunter. Then go check out the Fremont Troll for a second look the next day and see if he doesn’t seem a bit different this time around. Rest assured—very assured—that not every memorable vacation site in Washington requires a love of the great outdoors. Some families think the idea of a summer vacation where they never see a wall socket is nothing short of paradise. Others take a more realistic approach to the comforts of modern life. And when it comes to modernity, it is hard to find any summer vacation destination anywhere in the country that beats Washington’s Museum of Pop Culture. On permanent display inside this Seattle museum is the Science Fiction and Fantasy Hall of Fame, the Guitar Gallery featuring axes from some of the most players in music history and an interactive opportunity to try your own hand at being a rock star at the Sound Lab. In addition to these permanent features, the MOPC continually plays home to a variety of special events ranging from Indie Game Revolution to Star Trek: Exploring New Worlds. Trivia Question Number 1: What attraction in Washington that is one of the most-visited buildings in the world owes much of its initial popularity to Elvis Presley? What is a summer vacation anywhere without chocolate? The town of Issaquah is home to Boehm’s Chocolate and offers the chance for your family to live out their Willy Wonka dreams. Free self-guided tours are available without reservations throughout the year. Unfortunately, the $5 per person guided tours are extended only from September to May, so a summer vacation will have to bypass this opportunity. This walking tour offers the inside skinny on actual day-to-day operations inside a candy-making factory. And the gift shop is filled with many Boehm’s delicacies not available everywhere. Tacoma Museum of Glass “Hot Shop” by Ingrid Taylar – Flickr: Hot Shop. 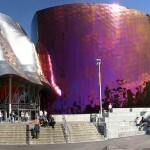 The 500-foot long Bridge of Glass is just the most intensely amazing part of the Museum of Glass in Tacoma. Except for maybe the Water Forest. Or the chance to see some truly creative artists plying their trade in the medium of glass. Everything you think you are bored about when it comes to the world of glass will be put to the test in Tacoma. A visit to this amazing museum will leave you looking at everything made of glass you come into contact with through new eyes. And while a museum devoted to the most breakable substance on earth may not seem like the ideal stop on your summer vacation plans, once you are arrive all worries will disappear. Even the youngest members of the family will be dazzled by this Tacoma must-see. Even those who prefer their summer vacation fun indoors will not want to miss out on the opportunity to walk through what appears for all the world like a rain forest right out of South America. Olympic National Park features incredible natural beauty all around you while camping, climbing, hiking, fishing, checking out the wildlife or staring up into the clear night sky for a star-filled show like you probably can’t get at home. Much of the world got its first look at the Seattle Space Needle as a result of being something of supporting character in his 1963 film It Happened at the World’s Fair. The movie hit theaters less than a year following the Space Needle’s official opening as the signature element of the 1962 World’s Fair. In addition, one of the most songs that Elvis sings in the movie was filmed in the structure’s revolving restaurant near the top of the Needle. Today, the Space Needle is arguably the single most familiar man-made landmark in the entire state of Washington and a must-see for any family whose summer vacation takes them to Seattle. An August summer vacation in Washington State will land you in the state just in time for the Omak Stampede which has been entertaining natives and tourists for more than 80s. What is the Omak Stampede? A huge rodeo with plenty of fun for all ages and every member of the family. As for the World Famous Suicide Race, well, this is one of those things that has to be seen to be truly believed. Watch in awe or fear as participants ride their horses down a 62-degree slope while hanging on for dear life to make sure the race’s name keeps its reputation as mere hyperbole. Summer vacationers should not forget that Washington also is home to a long coastline where the Pacific Ocean rolls ceaselessly into the left-hand border of America. The Pacific Ocean’s proximity means a number of opportunities to take a boat ride with the promise of witnessing one of the most extraordinary sites anyone will ever see in their lifetime. 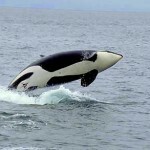 Depending on the excursion you take and the luck you bring, whale watching off the coast of Washington may mean being in the right place at the right to catch an Orca, Humpback, Minke or Gray Whale breaching through the surface. When you come to Washington in the summer you should definitely make plans to either rent a car or bring your own so that you can drive the world famous Cascade Loop Tour. 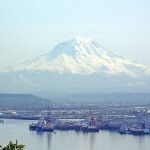 The driving tour begins and ends on Puget Sound, and traverses the incredible Cascade Mountain range twice. The first time you drive up and over the range to the eastern side of Washington. There you will find a surprisingly dry climate and hot summer sun. Eastern Washington is where many of the people from Western Washington go to vacation all year round. Not only does it include part of Washington’s wine country, but amazing drives along rivers and through forested groves, as well as a high-desert-plateau. You cross the mountains again on your return journey. Remember to plan time on the drive for stopping at view points for photos. The vista’s are truly stunning. You’ll also want to plan for a few days and nights on the trip. There are themed towns and activities that are fantastic for the entire family! 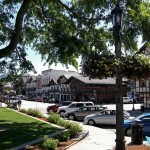 It doesn’t need to be October (Leavenworth is famous for its Oktoberfest and Christmas festivals) to enjoy all festivities available in the quaint Bavarian village tucked away inside Washington in the town of Leavenworth. Horseback rides, horse-drawn wagon rides, tubing, kayaking, arcades, casinos, live theater and much more and all to the ongoing soundtrack of oompa-pa-pa bands and residents in lederhosen and family-friendly wench wear. It’s truly a recreation destination. What more could a family want from their summer vacation? How about a spa, golf course and breweries and wineries when the adults finally need a little grown-up time. Trivia Question Number 2: Why is the very small town of Snoqualmie of such enormous importance to the history of television drama? Washington has mountains. Mt. Rainier is—and there is no room for argument here—simply one of the most physically perfect mountains in the world. When little kids draw a mountain for the first time, chances are it is going to strongly resemble the natural architecture of Mt. Rainier. If someone asks you to stop and think about a mountain, that image in your mind is likely to share many of the attributes of Mt. Rainier. A vacation to Washington does not need to take place during the height of winter to enjoy the aesthetic perfection of what is essentially the nature-made counterpart to the Space Needle. Then there is Rainier’s rather more infamous sister, Mount St. Helens. The 1980 eruption temporarily destroyed her natural beauty, but nature has been attempting to correct that cosmetic blemish over the decades. The mountain still has a long way to go to get back to her perfect shape, but the eruption definitely gave her a great personality and a visit to Washington without stopping for a few pictures and some contemplation about the sheer power that the world around us can unleash at any moment would be nothing less than an incomplete vacation. 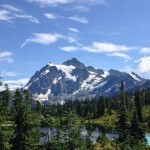 In northern Washington State take advantage of the scenic drive up the Mount Baker Highway to the viewing areas and hiking trails that lie between Mount Shuksan and Mount Baker. You’ll find a combination of easy and more difficult trails as well as fantastic views of both mountain summits from Table Mountain. Download a Mt Baker Highway Driving Guide, which contains maps, historical information and a mile-by-mile tour of the Mt. Baker Highway. Those three represent a mere sampling of the mountains in Washington capable of making a summer vacation there one that will never be forgotten. Do not for a moment believe that mountains only make great tourist destinations during the winter months. The thrills can be had on Washington’s peaks are too many to effectively describe. Then there are the peaks that do not officially exist in Washington, but are such a palpable part of the American consciousness that they may as well. A summer trek to Washington will not result in your finding the town of Twin Peaks, but you can find many of the exterior shooting locations that made that 1990s TV murder mystery such an indelible part of entertainment history. That waterfall featured in the opening credits of Twin Peaks is actually in Washington. You will want to set your destination plans for the small town of Snoqualmie if you want to enjoy the incredible view in person. A visit to Snoqualmie will also provide ample opportunities to visit some of the iconic spots featured in the show such as the high school and hotel which central to the story about discovering the killer of prom queen Laura Palmer. From the fictional home of one of the television’s most infamous murder victims to the epicenter of one of the most powerful explosions of the 21st century to the idiosyncratic little roadside attractions well off the beaten track to the center of modern American society’s obsession with technology, Washington has it all. A summer vacation in Washington State for the entire family can provide the simple pleasures of catching a trout to the more sophisticated enjoyment of the type to be found in any large vibrant metropolitan center like Seattle. Washington has vacation destinations that allow families to travel back to the prehistoric eras long before human ever walked the earth as well as innovative architecture wonders that look exactly like what the futuristic predictions of the 21st century made half a century ago. 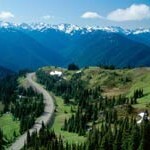 From the eastern border to the beaches lining the Pacific Ocean and from the southern border to the literal line separating American from a foreign neighbor, Washington is a place where every exit off the highway presents an exciting and brand new adventure sure to make the summer you visit there one of the most memorable for everybody in the family.